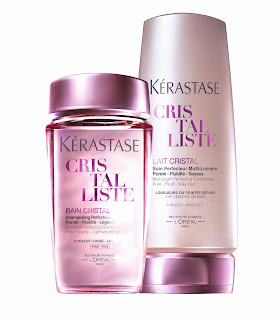 KÉRASTASE PARIS, the “hair and scalp expert since 1964” unveils Cristalliste, the best-kept secret for hair that shines bright from roots to tips. Hair that sparkles like crystal, weightless as light—the KÉRASTASE PARIS Cristalliste is enriched with the Liquid Light Complex, cleaning and purifying the hair’s roots, polishing the hair’s dry ends and enhancing its natural glow and shimmer. The result is hair that is feather-light and smooth, cascading down in a flowing manner, with luminous shimmer caused by the refraction of light from one hair fiber to the other. Leaves hair clean, luminous and free-flowing while its Ultra light consistency doesn’t weigh down hair. It cleans hair and gives its proper treatment. It makes the hair less tangled and adds shimmer to the hair. Perfect for fine and thin hair types. Is equipped with natural moisturizing action. The gel-like consistency feels light to the touch, making the hair feel soft, smooth and weightlessly light leaving it fresh and fluid. Also suitable for thick and fine hair types. Has a lot of Multi-luminous micro-particles & smoothing agents suspended in an ultrafine evanescent fluid. The ideal caring dosage gives the hair Ultra-luminous glow finish. It gives the hair intense reflection without any greasy effect that makes the hair Fresh & airy touch. Making it look pure, fluid, and defined. To avail of the new CRISTALLISTE line, visit your nearest Kérastase Paris salon. For more information, visit the official Kérastase Paris website at www.societedekerastase.com or call the Kérastase Paris hotline at (02) 672-7200.